High Living Touch Me Not Balsam. St. Catherine's is a stronghold of the nationally scarce touch me not balsam plants which are the only food source for the rare netted carpet moth caterpillars. As they are annuals and sensitive ones at that, the numbers of touch me not plants can vary greatly from year to year; this correspondingly affects the annual moth populations. Netted Carpet Moth on Balsam leaf. At St. Catherine's a great deal of work has been done over the years in an attempt to maintain or increase the number of plants each year; the aim is to ensure there are plenty of plants, on which the moths lay their eggs, and plenty of plants for the caterpillars to feed on. ..but what is unusual is that this seedling was spotted growing at a height of six feet on the west side of the wall at St. Catherine's. ... amongst the moss and the ferns. An image of the fully grown plant in late July showing caterpillar, flower and seed pod; when it is ready, the plant material inside the pod suddenly forms into a twisted coil and this propels the seeds far and wide. However it was still a surprise to find seedlings on the wall...especially so high up; to my knowledge they have not grown on this wall before. 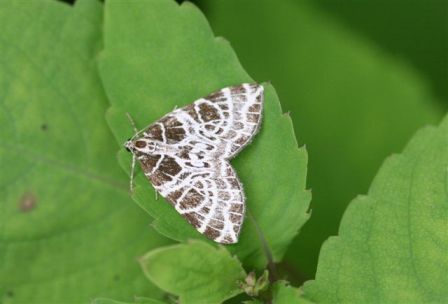 More posts on The Netted Carpet Moth, and the Touch Me Not Balsam plant may be found on this Blog. Wood Pasture Fence at Troutbeck Park Farm. In partnership with the tenant farmer, the National Trust has embarked on a major long term project to improve the wood pasture at Troutbeck Park Farm. The work is grant aided by Natural England through the Higher Level Stewardship scheme. Part of the project involves fencing off a section of the 'Troutbeck Tongue.' This area will be grazed by a small number of hardy cattle. Sheep will be excluded, thus allowing wood pasture to regenerate after recent centuries! of over grazing. The problem was to get the fencing materials up on to this steep and difficult terrain. The Central and East Lakes Rangers and the Fell Rangers worked together to complete this daunting task. The first leg of the journey: This is as far as the 'pickup truck' and trailer will go. "She'll take no more Captain!" The next phase of the journey: The indispensable power barrows loaded up with posts. Dave, James and Steve keeping the barrow level! Troutbeck Farm can be seen in the distance at the head of the valley. Onwards and upwards. Pete and Ade, Fell Rangers, on the second leg of the journey. The power barrows have reached their limit and can go no further. Nic and Laura seen here at the start of the last and most punishing leg of the journey. This image does not do justice to the steepness of this incline. Laura, Leo and Ray making their way up the gradient. The U shaped Troutbeck Valley below. And on into the mist. Wood pastures are of historic and cultural importance. In addition they provide a precious habitat for rare and specialised species that are so dependent on old trees. Managing the grazing effectively will bring long term benefits to wildlife and the landscape by ensuring that there will be more veteran trees in the future. Below are images of wood pasture from previous posts. An ancient Alder at Glenamara Park. Image © S.Dowson. Area Ranger, Ullswater. Wood Pasture at Glenamara Park. 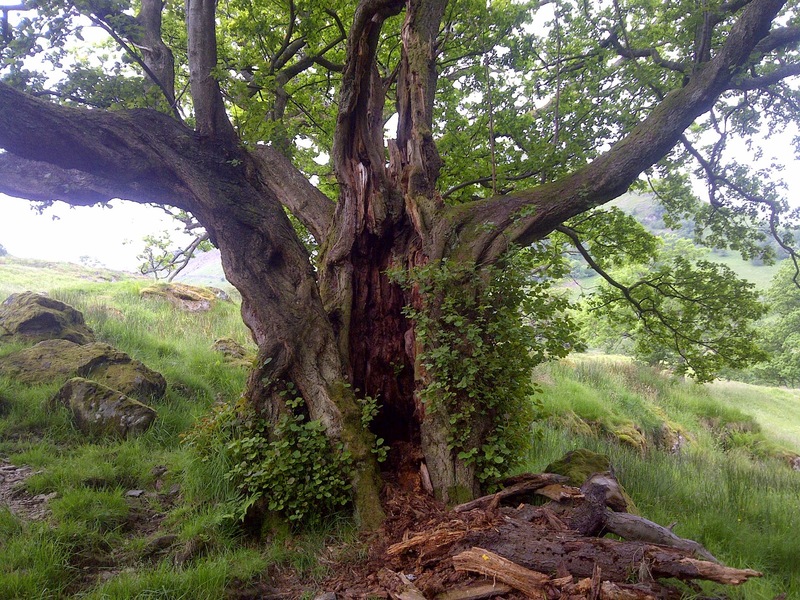 A pollarded ash at Troutbeck Park Farm. 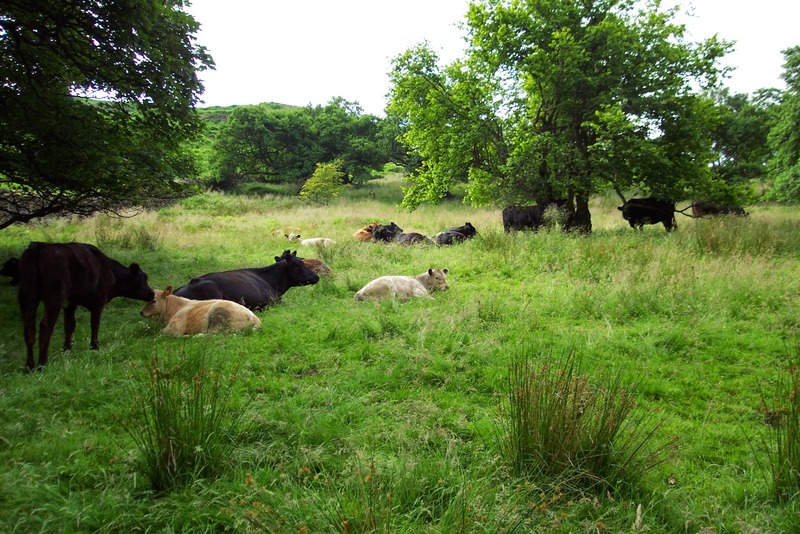 Several related posts are on this Blog....Glenamara Park...Plantations on Ancient Wood Pasture... Trees + Cows = Wood Pasture ...Tree Planting and Pollards in Wood Pasture at Troutbeck Park Farm. Wooden Raised Beds at the Footprint. Recently we have constructed six raised beds near the Footprint, principally for visiting children to plant up and care for in the years to come. transported to site by 'power barrow,' having been cut to size with a chain saw. The ground has been levelled and construction can begin! We disturbed what we think was a cave spider at the base of the wall. It looked intimidating but I think it was harmless and it was carefully relocated! The timber was given the 'distressed look!" A gravelled pathway was put in around the beds, being raked out by Ray. A raised bed was also put in place along the top of the bund that borders the St. Catherine's/Footprint car park. Stepover fruit trees will be planted about 4 feet apart...as marked out by the wooden pegs. Holes have already been dug out and filled with compost prior to the trees arrival. Step over trees are single tier espaliers trained to grow between 18" to 2' high, hence their name...stepover. curvature of the bund was used to good effect. The raised bed is ready and awaiting the trees arrival. and the plants are established.